Before I go any farther, I am posting this from my iPad. I apologize in advance for any inconsistencies with the formatting, spelling, and general wonkiness. Mr. Aitch and I are house/dog sitting for his brother this week in my hometown. My aunt also lives here so we’ve been spending time with her as well. On Monday I went a senior center where she leads exercises for the residents. I am embarrassed to admit that I couldn’t keep up with them. These women (including my aunt) are at least 20-30 years older than I am. Yesterday we went to a craft group. I took my knitting with me and the ladies there wanted to know all about my felted bag since I was working on the one for my sister. They weren’t quite sure how that flat piece of knitting was going to end up as the 3-D bag. 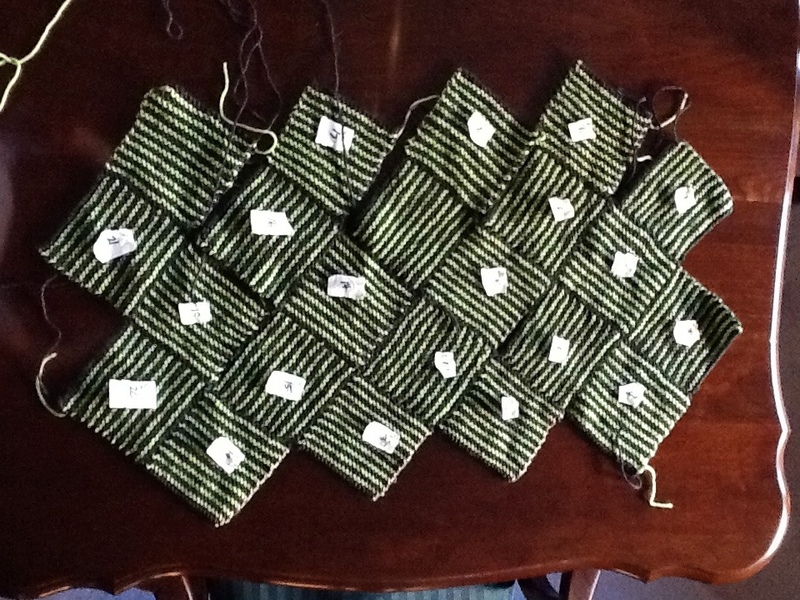 I did finish all the flat knitting and now have to sew the loose squares and side seams before I add the I-cord edging. The colors are really charcoal and lime green. The ladies also oohed and awed over my next project: Sheep Carousel Tea Cozy. I hope to get started on that soon. 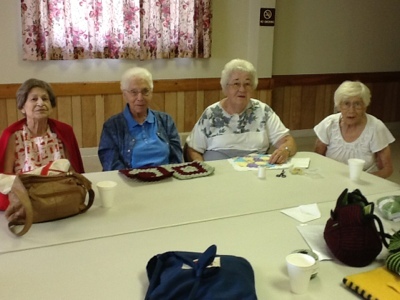 Here is a picture from the craft group. Unfortunately I didn’t think to take a picture earlier as one of the ladies had already left. So from l to r: my aunt Evelyn, Josephine, Dorothy, and Deo. A lovely group of ladies. This entry was posted in knitting and tagged crafts, knitting by Patti_is_knittinginflashes. Bookmark the permalink. Awww! What a great looking group of crafters. I hope I look that good when I am their age! Love the squares for your bag! What a fun day as well!